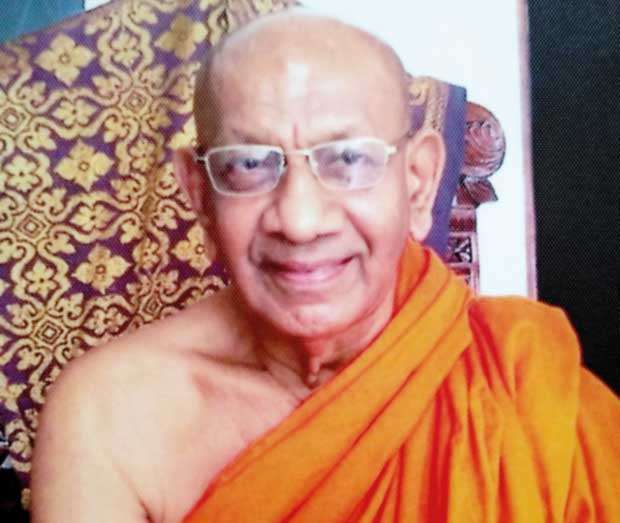 The Most Venerable Ahangama Ananda Nayaka Thera, the Chief Incumbent of Sri Vijayaramaya, Wellawatte, passed away on Friday, April 6, 2018. His cremation will take place today (April 9) at Henry Pedris Park, Colombo 05. 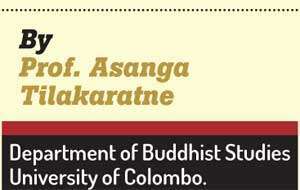 The Venerable Ananda Thera was born in 1932 to a respectable Buddhist family in Ahangama, Galle. His father was Hevapathiranage Arnolis Dikkumbura and mother was Dikkkumburage Aranolihami, who had passed away when the Venerable Thera was still at the very tender age of four. He entered the monastic life in 1940 under the guidance of Ahangama Sri Prajnaloka Maha Thera, founder of Sri Vijayaramaya, Wellawatte. The latter was an erudite monk known throughout the country as an oriental scholar and preacher of the Dhamma. Ananda Thera had his primary monastic education at the feet of his teacher, and subsequently, he had his further studies at Vidyodaya Pirivena, Maligakanda, one of the two greatest monastic education centres of the last century. After completing his basic education, the Venerable Thera had to undertake, along with his ‘monastic elder brother’ the most Venerable Ahangama Dhammarama Thera, who is heading the Los Angeles Buddhist Vihara since 1979, the responsibility of running the temple because their teacher, the Venerable Sri Prajnaloka Maha Thera, passed away in 1956, at a relatively young age. While the Venerable Dhammarama was active in educational and social services outside the monastery, Venerable Ananda had to attend to the religious needs of the Dayaks of the monastery and to the activities of the Sangha of his own Nikaya and those belonging to various other Nikayas, who lived in the area. In this manner, from his early adult life, the Venerable Thera developed an illustrous career of social and sasana service. "While the Venerable Dhammarama was active in educational and social services outside the monastery, Venerable Ananda had to attend to the religious needs of the Dayaks of the monastery and to the activities of the Sangha of his own Nikaya and those belonging to various other nikayas, who lived in the surrounding area." By the time he passed away at the ripe age of 86 the Venerable Thera was one of the leading members of the Sangha who has dedicated his life to social service. In his multi-faceted social service activities, the Venerable Thera was known for his ‘Gilana Upastana’ or taking care of the patients of the hospitals both in and out of Colombo. With his pleasant personality and excellent organizing skills, the Venerable Thera was able to enlist the support of a large number of well-wishers for his ‘hospital service’ activities. He supported in a similar manner the soldiers who had lost their limbs by providing them with artificial limbs, and he helped many helpless families of soldiers who sacrificed their lives in the course of the recent terrorist war. "By the time he passed away at the ripe age of 86 the Venerable Thera was one of the leading members of the Sangha who has dedicated his life to social service"
Another form of social welfare activity in which the Venerable Thera showed much interest is to help expecting mothers with medicine and other requisites. This he did from time to time, and death prevented him from taking part in another similar event which has been organized by him to take place just before the Sinhala New Year of this year. One of the many acts of kindness organized by him and one that attracted much social attention is ‘Abhaya-dana’ for animals under which he rescued many hundreds of cattle from slaughterhouses around Colombo and in many parts of the country. With generous support from many similar minded good people, the Thera practised this great act of kindness towards animals displaying that ‘metta’ knows no bounds. In addition, he was the advisor to ‘Meth Saviya’, a social service organization by means of which he was able to render educational and spiritual service to the society at large. He served also as the president of Munidasa Cumaratunga Foundation which was dedicated to perpetuating the scholarly and linguistic legacy of the great savant, Munidasa Cumaratunga. The Venerable Thera was a respected elder among the Maha Sangha in general, and in particular, he is a senior member of the monks belonging to the Dharmaraksitavamsa Amarapura Maha Nikaya, the current head of which is the Most Venerable Pandit Tirikunamale Ananda Mahanayaka Thera, the Viharadhipati of Siri Vajiraramaya. The Venerable Thera functioned as the head of judiciary board of his Nikaya. With the demise of the Venerable Thera, the Buddha Sasana loses another of its great members who lived a life dedicated to the service of the Sasana and the society. May the Venerable Ahangama Ananda Maha Thera attain the Supreme Bliss of Nirvana!
" In addition, he was the advisor to ‘Meth Saviya’, a social service organization by means of which he was able to render educational and spiritual service to the society at large. He served also as the president of Munidasa Cumaratunga Foundation …"